Travel back in time to live at the tops of South American mountains with the ancient Incan civilization. Click here to play! Gather ancient treasures, visit the Incan temples and call up on Incan Goddesses to help you in your search for riches beyond belief. If you want to succeed in this ancient time, you're going to have to seek out the help of the gods. If you can find two to five Incan Goddesses across a pay line, you'll be rewarded with up to 5000 times your original line bet. She will also substitute for most other symbols to create more winning combinations. If you can collect five Golden Sun Artifacts, you'll get 2500 times your bet. Two to five water jugs will pay out up to 1000 times your bet. 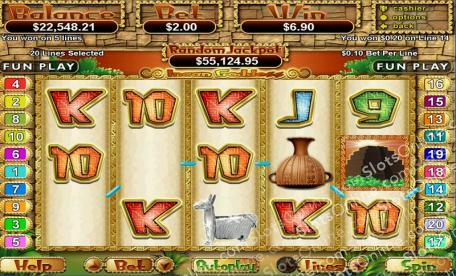 Also keep an eye out for Incan necklaces and Silver Llamas as these will both pay out up to 500 times your line bet. As with any ancient civilization, you will find a few surprises hidden amongst the ancient city. If you can uncover three or more Incan Temples anywhere on the board, you'll trigger a bonus feature in which you will be rewarded handsomely. Live the life of an ancient Incan and you'll come across treasures that you've only dreamed of. Two or more Incan Temples will multiply your total bet. Three or more will award you with 12 free games. Prizes are doubled during the free games and doubled again if the Incan Goddess appears in a winning combination. The exotic Incan Goddess with her long, black hair acts as a substitute symbol. She will replace all other symbols except the scatters. If you get two or more of this lovely lady, you'll receive 5000 times your original line bet. Any five of a kind win will activate a free gamble feature. You will choose between red and black for a chance to double your five of a kind win.